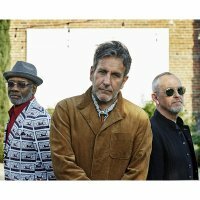 Due to illness, The Specials' opening Brixton Academy gig from last week had to be postponed until this Saturday (16th May). The band were originally due to play the Brixton Academy on Wednesday 6th May, but due to a throat infection for lead singer Terry Hall, the date was put back until Saturday 16th May, meaning that the first London date for their reunion was the following day - Thursday 7th May. Tickets remain valid, and, because of returns, there are a few tickets available for this date, priced at £35 + booking.